1 A None No Power Seat 1 A is a standard First Class flat bed seat. 1 J None No Power Seat 1 J is a standard First Class flat bed seat. 2 D None No Power Seat 2 D is a standard First Class flat bed seat. 2 F None No Power Seat 2 F is a standard First Class flat bed seat. 3 D None No Power Seat 3 D is a standard First Class flat bed seat. 3 F None No Power Seat 3 F is a standard First Class flat bed seat. 31 A None No Power Seat 31 A may have limited recline, and the proximity of the lavatories can be bothersome. 31 B None No Power Seat 31 B may have limited recline, and the proximity of the lavatories can be bothersome. 31 C None No Power Seat 31 C may have limited recline, and the proximity of the lavatories can be bothersome. 31 D None No Power Seat 31 D may have limited recline, and the proximity of the lavatories can be bothersome. 31 E None No Power Seat 31 E may have limited recline, and the proximity of the lavatories can be bothersome. 31 F None No Power Seat 31 F may have limited recline, and the proximity of the lavatories can be bothersome. 31 G None No Power Seat 31 G may have limited recline, and the proximity of the lavatories can be bothersome. 31 H None No Power Seat 31 H may have limited recline, and the proximity of the lavatories can be bothersome. 31 J None No Power Seat 31 J may have limited recline, and the proximity of the lavatories can be bothersome. 31 K None No Power Seat 31 K may have limited recline, and the proximity of the lavatories can be bothersome. 42 A None No Power Seat 42 A has extra legroom, but some of the space is impeded by the slide that protrudes from the exit door. Proximity to the galley can be bothersome. The tray table is in the armrest, making the armrest immovable and slightly reducing seat width. There is no floor storage for this seat during takeoff and landing. It can get cold by the exits during flight. 42 K None No Power Seat 42 K has extra legroom, but some of the space is impeded by the slide that protrudes from the exit door. Proximity to the galley can be bothersome. The tray table is in the armrest, making the armrest immovable and slightly reducing seat width. There is no floor storage for this seat during takeoff and landing. It can get cold by the exits during flight. 7 A None No Power Seat 7 A is an angle lie flat bed and has extra legroom due to the bulkhead, but the proximity of the lavatory and galley can be bothersome. There is no floor storage during takeoff and landing. This is a bassinet position so passengers with infants are often seated here. 7 B None No Power Seat 7 B is an angle lie flat bed and has extra legroom due to the bulkhead, but the proximity of the lavatory and galley can be bothersome. There is no floor storage during takeoff and landing. This is a bassinet position so passengers with infants are often seated here. 7 D None No Power Seat 7 D is an angle lie flat bed and has extra legroom due to the bulkhead, but the proximity of the lavatory and galley can be bothersome. There is no floor storage during takeoff and landing. This is a bassinet position so passengers with infants are often seated here. 7 E None No Power Seat 7 E is an angle lie flat bed and has extra legroom due to the bulkhead, but the proximity of the lavatory and galley can be bothersome. There is no floor storage during takeoff and landing. This is a bassinet position so passengers with infants are often seated here. 7 F None No Power Seat 7 F is an angle lie flat bed and has extra legroom due to the bulkhead, but the proximity of the lavatory and galley can be bothersome. There is no floor storage during takeoff and landing. This is a bassinet position so passengers with infants are often seated here. 7 H None No Power Seat 7 H is an angle lie flat bed and has extra legroom due to the bulkhead, but the proximity of the lavatory and galley can be bothersome. There is no floor storage during takeoff and landing. This is a bassinet position so passengers with infants are often seated here. 7 J None No Power Seat 7 J is an angle lie flat bed and has extra legroom due to the bulkhead, but the proximity of the lavatory and galley can be bothersome. There is no floor storage during takeoff and landing. This is a bassinet position so passengers with infants are often seated here. 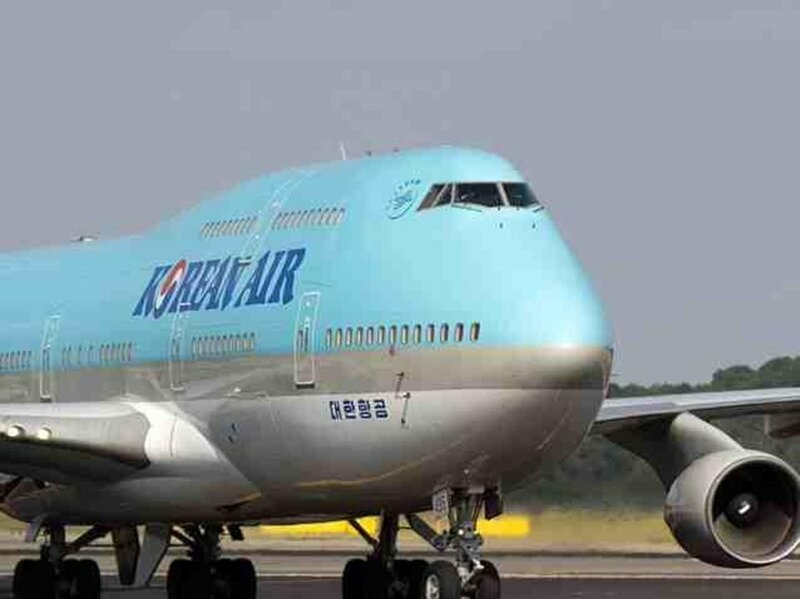 Korean Air operates three versions of the B747-400 aircraft. This version is equipped with 333 seats and offers three classes of service: First, Prestige, and Economy. First class is outfitted with Kosmo Sleeper flat bed seats and Prestige class is outfitted with Prestige Plus angle lie flat seats. 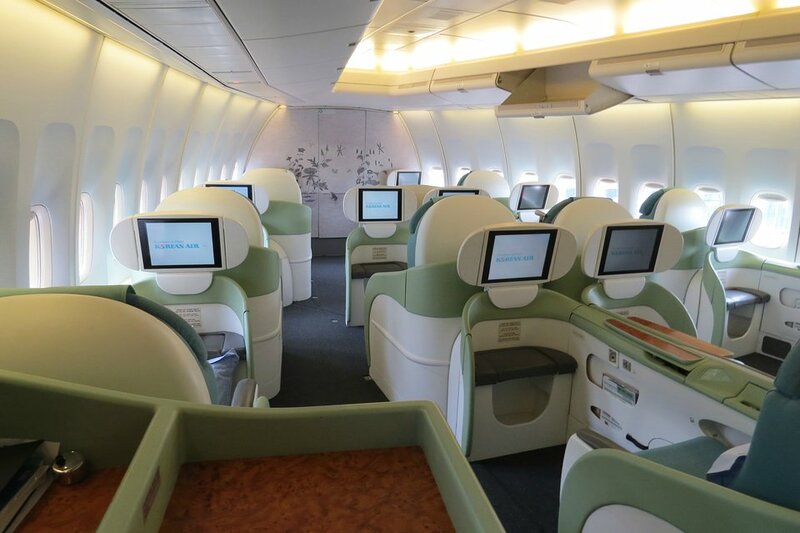 All seats in this aircraft are fitted with AVOD entertainment and in-seat power ports. An unusually uncomfortable seat for this flight, and I'm a regular KE flyer. The particular flight was operated by airframe HL7402, I've done this flight with two of their other remaining 747-400s, HL7460 and HL7495 and don't recall not being able to get to sleep. I prefer a full 180, but their 170 or so recline just keeps you sliding downwards... coupled with the fact that this particular flight had an issue with the aircon (otherwise, it would have been more bearable). Better than sitting back in economy for sure, but if all my points weren't with their Skypass program, I would have preferred Asiana for this trip. initially we were supposed to have a 777 but nice surprise to have a 747 for that flight! this is the best seat to have in business class. i love upper deck as it feels more intimate! the service was the best i had this year! Bravo!